In a large bowl, beat the butter, sugar, lemon juice and eggs. Combine the flour, baking powder and salt; stir into egg mixture alternately with milk, beating well after each addition. 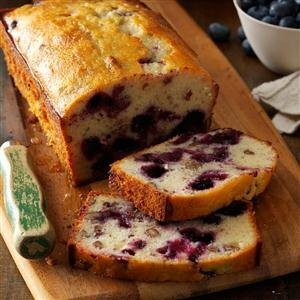 Fold in the blueberries, nuts and lemon peel. Transfer to a greased 8-in. x 4-in. loaf pan. Bake at 350° for 60-70 minutes or until a toothpick inserted near the center comes out clean. Cool for 10 minutes before removing from pan to a wire rack. Combine glaze ingredients; drizzle over warm bread. Cool completely. Makes 1 loaf (16 slices). Bake at 375° for 35-40 minutes or until golden brown. Remove from pans to wire racks to cool. Makes 2 loaves (12 slices each).